More shades: third in the trilogy. Minutes after shooting Goggle Dog, an hour or so after shooting a self portrait of myself reflected in Hedvig's shades, I met Victoria, my new friend and fellow graphic designer and photographer ('this is victoria'). I've seen some of her work on facebook and she's got a GREAT eye. She's just lovely. "The dress was from H&M about 3 years ago. The helmet is by Bern, which i bought through cycle chic - they have a lovely little cycling shop and blog. Perhaps you've seen it? And the sun glasses, Fabris Lane. Don't you love that name for a company? Fabris Lane. Has such a poetic ring to it. I really like Victoria, her style and overall sunniness. Can't wait to introduce her to the Cupcake Coalition. It's a quiet overcast day, and it feels like no one is in town. My torso is driving me CRAZY from a heat rash I got on Sunday at our friends' ping pong party, held while Germany destroyed England in the World Cup. I stupidly 'treated' it with anti-itch cream, which only made it grow stronger, like the German team. So now I'm trying, as per the internet, ice packs and baby powder. Off to the cinema, but before I go, back, by popular demand: Goggle Dog! I turn into such a baby when I see dogs, so please bear with me. 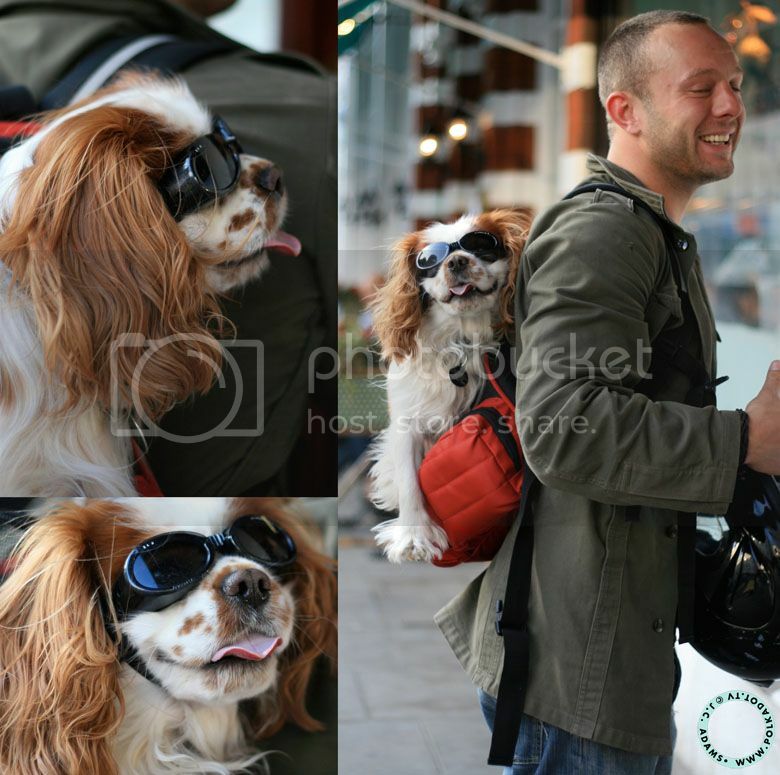 But that Goggle Dog is SOOOOO SOOOO adorable!!!! Look at him with his teeny little goggles. So cute. Victoria also seems like the cutest girl ever as well. I'm searching for a dress just like that right now. She looks picture perfect. By the way, I'm sorry to hear about your nephew, I hope he is recovering fine and dandy. The floral dress looks so pretty on her. With that little basket on her bicycle, this picture is just full of charm! That first pic is lovely! Love her whole look including that stellar smile. love her dress. especially the fact that she got it three years ago and it looks just as stylish now. glad your nephew is OK now. she looks so adorable in that dress! love the print.. and the doggie looks pretty cute with that sunnies! What an awesome outfit! I love how the helmet matches the dress. Wow . . . I miss checking Bloglovin' for a few days and I have 8 of your posts to catch up on!!!! Hey PD, how funny, I was just wondering if you were away. But - and this is a thank you and apology to all who have commented recently - I feel terrible that I haven't had a chance to visit anyone's blogs, really. And when I do, I leave one whole long comment to just one person, and there goes my window of time. Who knows, any of you could be my next victim ; ) but really: thank you! !